I dhiaaeiaa - I meditated upon the Naam - the name of the Lord with man - with my mind; thinking of the Guru all the time, keeping the Guru within your thoughts, then - carrying out those actions which the Guru tells me. In my man anthar gur aaraadhanaa - with my mind aaraadhanaa - meditating upon the Guru, with my than - with my body gur kehiaa saa kaar kamaavahu - carrying out that action which the Guru Sahib jee has kehiaa - has said. Rasanaa - with my tongue gun gopal nith gaaein - O my rasanaa - O my tongue sing the praises of Gopal - the creator of this world, norisher of this world. The gurmukhs; with their mind they are thinking about the Lord at all times, with their than - with their body guramukh rom rom har dhiaavai - with each hair upon his/her body the gurmukh is meditating upon the Lord, with their rasanaa - with their tongue always meditating upon the Lord, chanting God's name. Naam dhiaaeiaa - Maharaj Sahib jee says eating this bhojan is very simple - to dhiaaeiaa - to meditate, to focus and through these three ways: with your man - mind, than - your body and with your rasanaa - with your tongue meditate upon the Lord. That is the way of eating this food - this sach bhojan - this food of truth. Maharaj Sahib jee is saying jeevanaa - what is life? 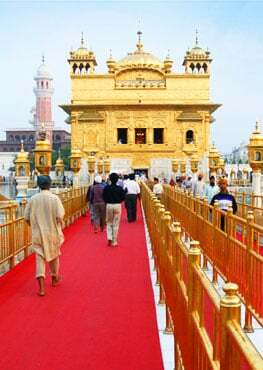 Har jeevanaa - it is to live with that Hari, norisher, Waheguru Lord - that cherisher of the world Waheguru Lord God - that is the true jeevanaa - to live. In spiritual knowledge, in the love of God that is the true life. Maharaj Sahib jee is saying jeevanaa - this spiritual life is the true life, har jeevanaa - har also means out of the rest of, out of the rest of jeevanaa - out of the rest of the lives. What is this jeevan? What is this spiritual life? What does it entail Maharaj Sahib jee says? It entails har jap - meditating upon the Lord in the saadhasang - in the Guru's congregation sitting with the gurmukhs in the charan, in the lotus feet of the Guru, in the presence of Siri Guru Granth Sahib jee Maharaj and meditating upon the Lord. Guru Sahib jee says pause and think about this. Anik prakaaree basathr outaaeae - He is adorned with anik prakaaree - many types of basathr - clothes outaaeae - meaning to wear. Many times we see the people who follow the spiritual path, follow very simple life and the fashions of the world do not appeal to them. Maharaj Sahib jee is telling the world, O world! what you think is the razzmatazz of the world they are not even pulled in by that; by the attachments of Maya, by the attachments of the false illusion. What are they wearing? Sathiguru Nanak Devjee Maharaj tells us on Ang 16 of SGGSjee: rathaa painan man rathaa supaedhee sath dhaan - those Gurmukh piaarey, their mind is imbued with the dark deep red color of God's name, of the love of God supaedhee sath dhaan - attached to that Waheguru and compassion are the pure white clothes that the Gurmukhs wear - the followers of the Guru wear. Neelee siaahee kadhaa karanee pehiran pair dhiaan - the darkness of sin is taken away with the blue clothes of meditation upon the Lord, pehiran pair dhiaan - these are the robes of honor, to focus upon the Lord. These are the robes of honor that I wear. So Maharaj Sahib jee is telling us that those people who sing the praises of the Lord they are truly wearing the true clothes of God's Grace. Those saints who ridhai - within their heart have recognized the maarag - the path to Hari, the Lord, Maharaj Sahib jee says know that they ride the hasathee - the elephants, they ride rath - the elephants, they ride as - horses, asavaaree means to ride upon. If we look in "Sehaskriti Salok" by Guru Arjan Devjee Maharaj, Maharaj jee says AwrUVqy AsÍ rQ nwgh buJMqy pRB mwrgh ] (1356-12, shsik®qI, mÚ 5) (aaroorh-tay asav rath naagah bujhantay parabh maargah) - to recognize the path to the Lord, Guru Sahib jee says that this is aaroorh-tay this is to ride upon the asav rath naagah - to ride upon the horses, chariots and elephants. What does this mean? Listening to the Guru's word is riding upon the horse, accepting what the Guru says is getting into the chariot and practically carrying out what the Guru says in your life, that is riding the elephant. When we get upon the horse we ride down swiftly and that person who accepts what the Guru says is riding through swiftly - not looking left or right. When we get into the chariot we have the protection of being in the chariot, we are being carried along and in the same way we will be carried along if we accept what the Guru says. Riding upon the elephant, the elephant has no regard for anyone else, it walks upon its own path, it doesn't care. In the same way the Gurmukh piaraa who lives a practical life walks upon the Guru's path and doesn't care for praise and slander. So these are the chariots, the elephants, the horses that they are riding upon. By meditating upon the charan - the Lotus feet of Waheguru which is the Guru's shabad - the Guru's mantra - the Waheguru mantra, the mool mantar, gurbani, by meditating upon the Guru's Words dhiaaeiaa - by focusing upon them where? Man in the mind and than - with the body anthar - deep within. Maharaj Sahib jee says that the dhaas - the servants of the Lord find Hari, Waheguru who is the nidhaan - who is the treasure of all sukh - of Eternal Peace. All of their life is colored in that peace which cannot be broken.